The National German Exam is administered each year to nearly 26,000 high school students of German. The Exam, now in its 59th year, provides individual diagnostic feedback, rewards students through an extensive regional and national prize program, and creates a sense of accomplishment. Exam results provide teachers a means of comparing students in all regions of the country, as well as programmatic data to help inform curricular decisions. The Exam is delivered electronically and has four levels, each with the same format. The Level 2, 3, and 4 Exam is administered in the winter so qualifying students in the 90th percentile can apply for the AATG/PAD Study Trip Awards, a four-week study trip program to Germany. Students taking the Level 1 Exam have not had the requisite two years of language instruction to qualify for the AATG/PAD Study Trip Awards, which allows schools to administer the Level 1 Exam in the spring. 2018-2019 Calendar. The Exam period for the Level 2, 3, and 4 Exams is December 3, 2018 to February 1, 2019 and registration begins October 1, 2018. The Exam period for Level 1 Exams is April 1 to April 30, 2019 and registration begins February 1, 2019. View the complete calendar. Regular registration for the Level 1 Exam runs February 1 through March 15. Late registration runs through April 19, 2019. Note: A $30 fee will be applied for late registration. Register for the Level 1 National German Exam. Member registration and Non-Member registration. Structure and Content. Each level of the Exam is comprised of 100 multiple choice questions divided into two parts with 50 questions each. The listening and viewing portion is 40 minutes in length and consists of a series of short audio and video segments. The reading portion is 45 minutes in length and consists of a variety of print texts, including graphs and images. All materials used in the exam come from authentic resources. No one method, textbook, or approach is given preference over any other in designing the exams. The exams do reflect the principles of the World-Readiness Standards for Learning Languages and their focus on developing students' abilities to communicate effectively and with cultural competence as members of multilingual communities. Exam materials are selected with great care to be interesting, varied, and accessible to a large, general student population. The Exam is designed to be well within the reach of all students. Targeted Proficiencies. It is important to note that the National German Exam is not a proficiency assessment. The Exam measures the performance of students based on what they have typically learned in German classrooms. The National German Exam targets levels of proficiency that high school students can generally achieve at levels 1, 2, 3 or 4 in listening and reading. The Level 1 Exam targets student proficiencies in the Novice Low to Mid range as measured by the ACTFL Proficiency Guidelines. These students understand some ideas on familiar topics containing phrases, simple sentences, and frequently used expressions. They can understand the main point and a few details in short conversations, messages, and announcements. The Level 2 Exam targets student proficiencies in the Novice Mid proficiency range. These students understand the main idea and some details on familiar topics expressed in sentences, short conversations, presentations, and messages. The Level 3 Exam targets student proficiencies in the Novice High to Intermediate Low proficiency range. These students understand the main idea and many details on familiar topics expressed in a series of connected sentences, conversations, presentations, and messages. They comprehend information related to basic personal and social needs and relevant to their immediate environment such as everyday life, school, and community. The Level 4 Exam targets student proficiencies in the Intermediate Low to Mid proficiency range. These students understand the main points and most details in conversations, presentations, and messages on familiar topics. They also understand the main idea and some details on unfamiliar topics. They demonstrate emerging evidence of the ability to make inferences. They comprehend texts focused on relevant real-world topics of general interest. Question Types. All exam items are based on an authentic audio or video clip, or a print text. Each set of items consists of at least 5 and typically no more than 10-12 multiple choice items. The questions that make up an item set target a range of skills. Each item set has at least one question in which students are asked to identify the main idea, 2 to 3 items in which students identify supporting details, and at least one question to project beyond the text, e.g. to make inferences, to detect the tone of the text, or to identify the intended audience. The item set may also include a question focused on vocabulary. Answering these types of questions involves skills and strategies that are critical to comprehension: Skimming a text to get the main idea; scanning to identify details; and inferring, a higher-level skill to develop deeper understanding. These higher-order, or critical thinking skills are assessed to a greater extent in Level 3 and Level 4, but questions assessing critical thinking are also included in the Level 1 and 2 exams. Whether they are practicing for the Exam, or engaging with any audio, video, or print materials in the interpretive mode of communication, students should encounter questions that move them from getting the main idea and identifying details, to making inferences and projecting beyond the text. Supporting detail. Identifying supporting details refers to understanding specific and significant pieces of information found in the text. Supporting detail questions often involve identifying who, what, when and where, and, especially when the source material is a chart or graph, how much. Audience. Identifying the primary intended audience refers to extrapolating for whom the text was created. These questions typically ask students to identify who might be interested in listening, viewing or reading the text or who might benefit from the information in the text. Format. The National German Exam is delivered in electronic format compatible with Windows and Apple operating systems and various web browsers. Students will need access to a computer connected to the internet in order to take the exam. Headphones or earbuds are required for students to complete the audio portion of the exam. The online delivery system allows for the inclusion of video clips as source material for the exam. Students will be able to pause audio and video materials, and replay portions as many times as they wish within the allotted time. Practice Exams for levels 1, 2, 3, and 4 are available on our website.The Practice Exams reflect the structure and functionality of the NGE, which allows students to gain familiarity with the Exam and teachers to test the Exam's functionality in advance on the devices that will be used. The Administration Manual is available for download here. How Results are Reported. National German Exam results provide a means of comparing students in all regions of the country. The results also serve as a diagnostic tool to inform curricular decisions. Teachers receive printable Results reports, detailed Skills reports, along with printable individual student reports. The Results Report includes student raw scores as well as their Percentile rankings, which indicate the performance of an individual student in comparison to all students who took the National German Exam across the US. The achievement level for each student’s performance and whether or not they qualify for the Study Trip Award are also included. The Skills Report provides information on how students performed on specific question types, such as identifying main ideas, comprehending idiomatic expressions, and making inferences. This report is provided to help teachers better understand where their students did well and where students may need more instruction. Honoring students. The National German Exam provides an excellent opportunity to highlight student success and promote German. All Gold, Silver, and Bronze Award Winners are honored in the Presidential Honor Roll. Free downloadable certificates to recognize student performance are available. Certificate Seals are available in our store. 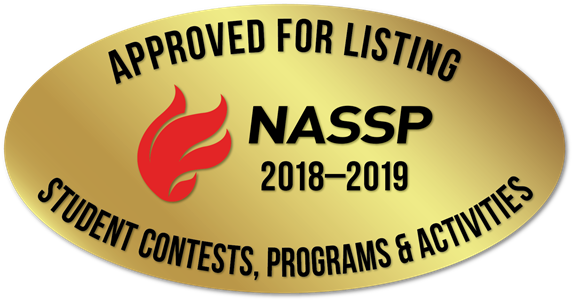 The National Association of Secondary School Principals has placed this program on the NASSP National Advisory List of Contests and Activities for 2018-19.